A piece of jewellery designed to represent the power of everlasting love, with the classic figure of eight symbol set with diamonds and fitted with a bolo fastening. Simply adjust the fastening in order to achieve the desired look and fit. 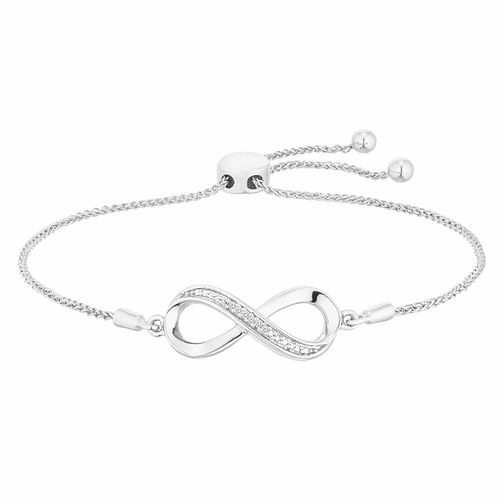 Sterling Silver Diamond Infinity Adjustable Bracelet is rated 5.0 out of 5 by 8. Rated 5 out of 5 by Anonymous from Beautiful bracelet I bought this as a 21st birthday present for my son's girlfriend. It is so pretty and really quite delicate. The fact the bracelet is adjustable means it's suitable for most people as can fit even the smallest wrist. I am completely delighted with my purchase and can't believe I got it in the sale at such a fantastic price. Rated 5 out of 5 by Anonymous from Lovely piece of Jewellery Bought this for a friend. It is extremely good value for money and a dazzling piece of jewellery. Very noticeable and liked by others.